The urgency of the emergency was brought home last week with a tidal surge in the North Sea threatening the east coast. Thankfully it didn’t quite coincide with high tide when it would have mounted a significant challenge to flood defences. Regional flood defences were developed after the 1953 disaster in order to protect against these tidal surges, but sea level rise and climate disruption is adding new factors to consider. A new report in Science this week found that the warming of the oceans was accelerating and the resulting ‘thermal expansion’ is likely to raise sea levels by about 30cm by the end of the century (on top of the rise in sea levels from melting ice and glaciers). These warmer oceans are also a major factor in increasing the severity of storms, hurricanes and extreme rainfall. So where is this local area of Essex’s planning for greater overall resilience to climate change? The need for an Environment and Climate Change Strategy has never been clearer, but Maldon District Council seems clueless or wilfully careless. One of our independent town councillors, Vanessa Bell, did refer to the tidal surge and the potential future impacts of flooding when the council discussed a riverside planning application this week. Once again, the local, independent politicians have demonstrated a duty of care that I hope will be shared by the tranche of Conservative incumbents. Another reason I suggested that this District might be particularly concerned about addressing the issue of climate change in my recent correspondence was the risk of drought in this primarily agricultural area. We begin from a dry base here, the Met Office reports that much of eastern England receives less than 700 mm of rainfall per year and includes some of the driest areas in the country. The driest part of the UK is generally reported to be St Osyth (17 miles from here in BoC), which has been named as the driest place in the country for the past 40 years with an average annual rainfall of only 506.9mm. That 2017 measurement is worryingly close to the average figure for the driest place in the UK and the 2018 record of erratic conditions is somewhat indicative of a pattern associated with global weirding. The total 2018 rainfall is higher than their average figure though, if not by much. Tracing any trend obviously needs a longer set of data, but continuing dry summers could cause problems if water isn’t captured and stored when it does rain. According to the Met Office climate projections the ‘chance of seeing a summer as hot as 2018 was less than 5% in the 1990s, but already that risk is between 10% and 20%, and by mid-century will be 50%’. Green’s have an on-farm reservoir, so they can mitigate some of this seasonal fluctuation – but where’s the district-wide strategy? Down on Arcadia Road allotments the dry summer hit plot-holders, a rumoured turning off of the on-site taps never happened but maintaining sufficient irrigation still proved difficult leading to a depleted Allotment Show in August. Reports at the show on the 2018 growing season included: ‘such a hard year down on the allotment’ and ‘one of the most difficult and challenging years for growing vegetables I can remember’. Yesterday our plot neighbour told Claire that last year had been the driest he could remember in the 40 years he’d been coming to the Allotments. In early August plot holders were gently reminded that: ‘the use of hosepipes to directly water plots is not allowed, see condition of tenancy 8 on your membership card. You may use hoses to fill your storage tanks ONLY. In spite of the current weather conditions some plot holders persist in this activity’. In October the plot rates went up, with the Plot Secretary noting that ‘[t]he increase in water usage and the increase in the water costs have been a driver for this action’ and during the summer on-site bonfires, barbecues and other forms of burning were banned after an un-attended blaze got out of control and the fire brigade had to be called. It wasn’t all negative news, in October a local beekeeper reported that ‘This year’s splendid summer has helped the UK’s beekeepers to report the highest yields for four years according to the National honey survey results published yesterday’. Sadly this was qualified however in his following sentence: ‘However this is no cause for complacency as a honey crop of 30 lbs per colony would have been considered small compared to yields a few decades ago’. He didn’t attribute a cause for this decline, but made the case for planting more appropriate nectar rich plants. Bees are certainly being affected by more than declining plant diversity though and it’s not difficult to imagine that the local field monocultures are also dosed in pesticides. 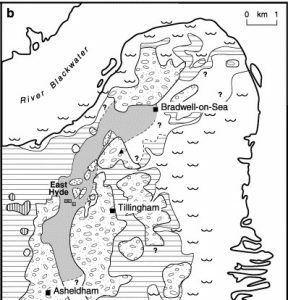 Something of Essex’s chemical agriculture can be witnessed in the watercourses the fields run off into and the Essex Rivers Hub reports that upstream of here the River Crouch is affected by ‘diffuse agricultural pollution entering the river’ which ‘is described as ‘chronic”. There’s little reason to assume that the fields draining into the tidal Crouch produce any less pollution. A resilient and healthy future for the region depends on the implementation and maintenance of ecologically appropriate mitigation and adaptation plans. Those plans must be informed and responsive to a changing climate – and change is here. I don’t care if Maldon District Council call these plans an Environment and Climate Strategy, as they have done in the past, but I do care about whether they address the issues of climate change and environmental degradation.